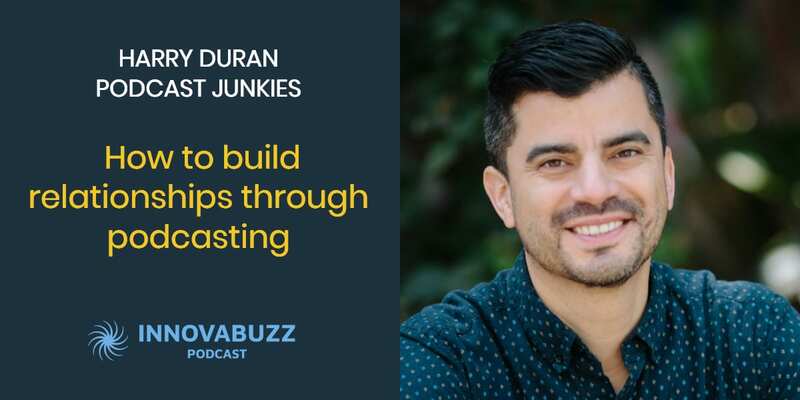 In this episode, I’m really excited to have on the InnovaBuzz podcast as my guest, Harry Duran, host of the Podcast Junkies Podcast. Harry also runs a full-service Podcast Production and Marketing service, helping successful thought leaders grow their network and expand their reach through podcasting. The value of podcast interviews to build relationships, grow your network and position yourself as an expert in your space. the importance of experimentation and being comfortable with failure. Erik K. Johnson on episode 157 suggested we interview Harry. Harry is also the founder of FullCast, a full-service done for you podcast production and marketing consultancy. If you are the smartest person in the room then you are in the wrong room. You need to be somewhere in the deep end. You need to be constantly challenged about what you are capable of and what it is you don’t know so that you can get information from people who can inspire you to do things that you didn’t think you were capable of. Focus on what your genius is. There are four types of tasks: those you are incompetent at, those you are competent at, those you are excellent at, and those you are a genius at. Get those incompetent and competent off your plate as fast as you can. It is something that you have no business doing because there are people who are experts in that and they can do it better than you. You have to put a price on what an hour of your time is worth. Growth comes from pushing yourself outside of your comfort zone. If you sit in that comfort zone for too long, then you are not learning the latest and greatest in your industry. Every entrepreneur struggles with impostor syndrome. Realize that it is always going to be a part of your journey and you shouldn’t let it be a hindrance. Like with everything else in life, it is important to become a student of the craft. Go deeper on those interesting topics because your listener is hearing that as well and they want you to have that deep and interesting conversation because, at the end of the day, podcasting is a very intimate medium. Never forget that there is always a third person in the room – it is you, your guest, and the listener. Always speak to a listener as if they are there and never leave them out of the conversation. Pull them in on that journey with you. Be comfortable with silence. A lot of times, when you ask a tough question, the lack of immediate response is not because your guest does not have anything to say. It is because they are thinking about something to say. Little verbal cues are very helpful for you to allow the conversation to proceed at its own pace. Treat your guest like gold. Value their time and the time they’ve come to spend on your show, and the contribution they are making to your audience. Be as focused as you can in everything they have to say. Express genuine interest in everything that they are doing and really leverage your platform as a way for them to get their word out about what they do. Always have a detailed follow-up. Let your guests know when their episodes will be published. Profit doesn’t have to be only dollars. It can come in the form of sponsorship or getting more opportunities to speak on other platforms. Each platform has its specialty. Be thoughtful about how you are promoting on all the different platforms. Manually loading captions on a YouTube video will get you more SEO juice than just allowing YouTube to use its automated captions feature. People consume content in different ways. You can’t assume that everyone who listens is immediately going to get all the content that you are publishing in one shot. Here are Harry’s answers to the questions of our Innovation round. Listen to the interview to get the full scoop. ﻿#1 thing to be more innovative – Surround yourself with people who are smarter than you. Best thing for new ideas – Attending conferences related to your field. Favourite tool for innovation – Slack, Process St., and Sam Carpenter’s Work the System. Keep project / client on track – Regularly scheduled communication. Check in with them periodically to find out what’s working and what’s not. Differentiate – Lead from your heart and be the first one to admit mistakes. Try to develop a relationship with your prospects, your listeners or your customers where you are speaking honestly about what it is that is important to you. You can’t be all things to everyone. Letting people know what it is you stand for is important. Be comfortable with failure. As entrepreneurs, we have to be comfortable trying new ideas out because we are at the forefront of business. We have to try new things out because it’s where new ideas come from. Be comfortable with failure and learn how to fail fast, to fail often, and get back up. Inevitably, after you’ve experienced enough of them, you will then learn the one idea that makes sense which you wouldn’t have gotten if you hadn’t failed with the other 99 that you tried. You can reach out and thank Harry through his website, Twitter, and on Instagram. Harry suggested I interview Zachariah Moreno and Rockwell Felder, founders of Squadcast. So Zach and Rock, keep an eye on your inbox for an invitation from us to the InnovaBuzz podcast, courtesy of Harry Duran. Get Your FREE Copy of Harry’s Ultimate Podcast Launch Gameplan. This Gameplan will outline for you the 6 pillars of success needed prior to the launch of your show! He DJ-ed for their high school dance. In 2012, he created a mobile app with his friend called Know Your DJ. Since 2014, he has interviewed over 85 amazing podcast personalities including Pat Flynn (host of Smart Passive Income), Cliff Ravenscraft, Lea Thau (host of Strangers), Helen Zaltzman (host of The Allusionist), and Jordan Harbinger, (host of The Art of Charm), just to name a few.